‘A Booke of Engines and traps to take Polcats, Buzardes, Rattes, Mice and all other kindes of Vermine and beasts whatsoever, most profitable for all Warriners, and such as delight in this kinde of sport and pastime’. It was printed in 1590, a year after his death. Mascall did not invent these traps, he only describes what is already available, as many early writers did, whatever their subject. My book is a photocopy of the original. The pictures can be vague and the descriptions no better. 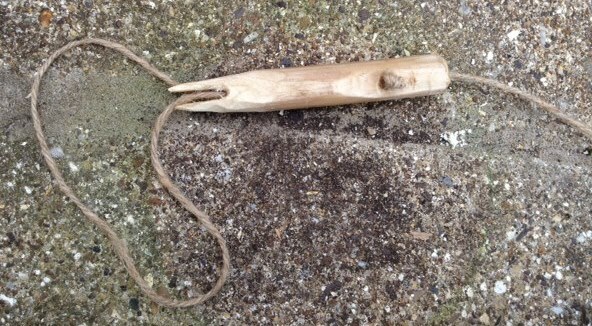 I decided to make the ‘Hare Pipe’. It looked quite easy to construct, the picture and instructions seemed very clear and it would not need any special equipment. The victim puts its head or foot through the noose, the more it struggles, the more the teeth on the pipe drive into the flesh. Not very pleasant, but nor are most other traps. Mascall says that the pipe is made of elder, presumably as the pith can easily be removed to make a pipe.He also says that you can make the pipe from metal if you want to catch dogs and foxes. 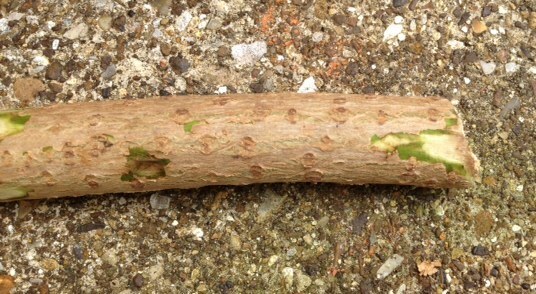 I fetched a saw and cut several lengths of elder form a tree in my garden. I chose a piece that had plenty of pith in the middle and went back to my garden seat. I found my sheath knife, which must be 40 years old or so, and began to slice off the bark. The knife may look rusty, but it is very sharp. I flattened two sides of the stick and began to cut a point. Then, very carefully, I cut back into the stick to start forming the two teeth. This was fiddly, but safe enough as I kept my fingers well out of harm’s way. I used to be a butcher’s boy many years ago and I have a very healthy respect for sharp knives. Once the teeth were cut I cut off the send. Holding the knife edge against the wood at the length that I wanted I rolled the wood several times to give a good ring before whittling off the surplus wood. I found some wire and a long nail that I used to push the pith out of the stem. Mascall’s drawing shows the string knotted on the outside of the pipe, so I drilled a hole with the point of my knife and cleaned the edges of the hole. The next part was fiddly. I pushed the noose string through the hole and tied several knots to form a big lump of string. I fed the other end of the string back down the pipe, using the wire to push it through. I tied a peg onto the end and the trap was finished. One thing that I should say is that the ‘Hare Pipe’ will never be used; it is only for show at my displays and talks. P. S. Mascall also mentions using hellebores to poison mice. Hellebore roots or seeds can be mixed with barley meal and some honey and made into small cakes. Herbals from the ancient Greeks and Victorian gardening books both suggest a mouse poison made from hellebores.